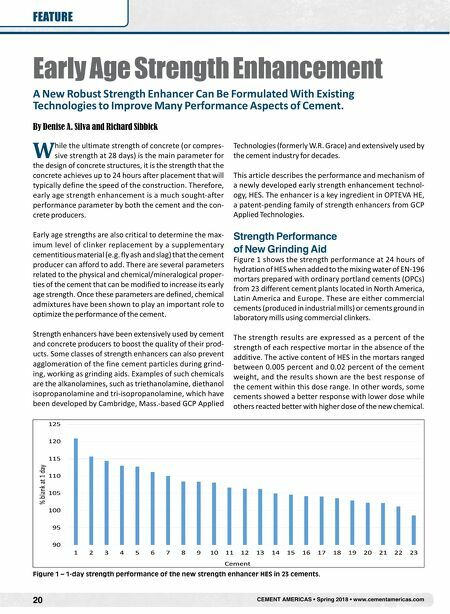 www.cementamericas.com • Spring 2018 • CEMENT AMERICAS 21 FEATURE (a) (b) Figure 2 – 1-day strength performance in EN-196 mortars prepared with blends of (a) Cement 3 and (b) a lab ground cement using clinker from Cement 1, with the indicated supplementary cementitious materials. Mechanisms of HES Mechanistic studies were conducted using two cements with different reactivity to the new technology, select- ed from Figure 1: Cement 1 is an industrial Type I cement according to the ASTM C150 classification (or CEM I accord- ing to the EN specification), and Cement 9 is a lab-ground cement using an ASTM C150 Type II/V clinker (correspond- ing to CEM I, but with low C 3 A content for higher sulfate resistance). Pastes at water-to-cement (w/c) ratio of 0.4 were prepared with these two cements and distilled water for assessment of the impact of the new technology on cement hydration and microstructure after 24 hours of hydration. Quantita- tive x-ray diffraction (QXRD), mercury intrusion porosime- try (MIP) and optical microscopy of thin, polished sections were used for the investigation. QXRD allows the identification and quantification of crys- talline phases in polycrystalline materials, such as cementi- tious materials. 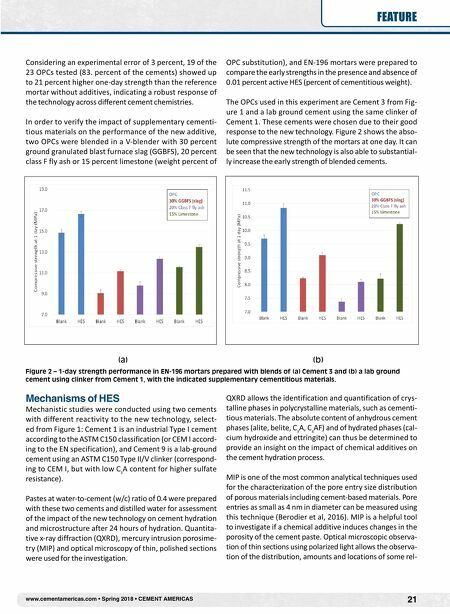 The absolute content of anhydrous cement phases (alite, belite, C 3 A, C 4 AF) and of hydrated phases (cal- cium hydroxide and ettringite) can thus be determined to provide an insight on the impact of chemical additives on the cement hydration process. MIP is one of the most common analytical techniques used for the characterization of the pore entry size distribution of porous materials including cement-based materials. Pore entries as small as 4 nm in diameter can be measured using this technique (Berodier et al, 2016). MIP is a helpful tool to investigate if a chemical additive induces changes in the porosity of the cement paste. Optical microscopic observa- tion of thin sections using polarized light allows the observa- tion of the distribution, amounts and locations of some rel- Considering an experimental error of 3 percent, 19 of the 23 OPCs tested (83. percent of the cements) showed up to 21 percent higher one-day strength than the reference mortar without additives, indicating a robust response of the technology across different cement chemistries. In order to verify the impact of supplementary cementi- tious materials on the performance of the new additive, two OPCs were blended in a V-blender with 30 percent ground granulated blast furnace slag (GGBFS), 20 percent class F fly ash or 15 percent limestone (weight percent of OPC substitution), and EN-196 mortars were prepared to compare the early strengths in the presence and absence of 0.01 percent active HES (percent of cementitious weight). The OPCs used in this experiment are Cement 3 from Fig- ure 1 and a lab ground cement using the same clinker of Cement 1. These cements were chosen due to their good response to the new technology. Figure 2 shows the abso- lute compressive strength of the mortars at one day. It can be seen that the new technology is also able to substantial- ly increase the early strength of blended cements.